Majestic reddish sandstone formations around the small, artsy town of Sedona in northern Arizona in America create natural scenes of awesome beauty. The area can sometimes be very hot in mid summer. The ideal times to come are April to mid-June and mid-September to mid-November (when nature's autumn foliage display of red, orange and yellow colors occurs). Take most of your photos in the late afternoon when the sun's low-angled rays intensify the red sandstone hues. Morning light is fine, too, but many of the top photogenic sites are better positioned for late-day shots. The formations were carved over the ages by the erosive effects of wind, water and ice. They are varied: buttes, pinnacles, canyons and mesas. The sandstone acquired that hue because its iron component had rusted (oxidized). 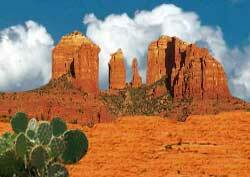 For 75 years the Sedona area has been serving as a backdrop for Hollywood movies.